What were Lewis and Clark to make of the creature they had found—the animal Joseph Whitehouse dubbed a “monstrous large fish?” Since the term “dinosaur” literally had not been invented yet, they had no way of knowing they had stumbled on the fossilized remains of a plesiosaur, a carnivorous, predatory marine reptile that flourished in the warm inland sea that covered the Great Plains over 65 million years ago. A number of varieties or sub-species of plesiosaur have been identified in the 200 years since Lewis and Clark found their specimen. Though the size and characteristics differ somewhat, they all have a long neck, a broad, rounded body, flippers, and a relatively short tail. 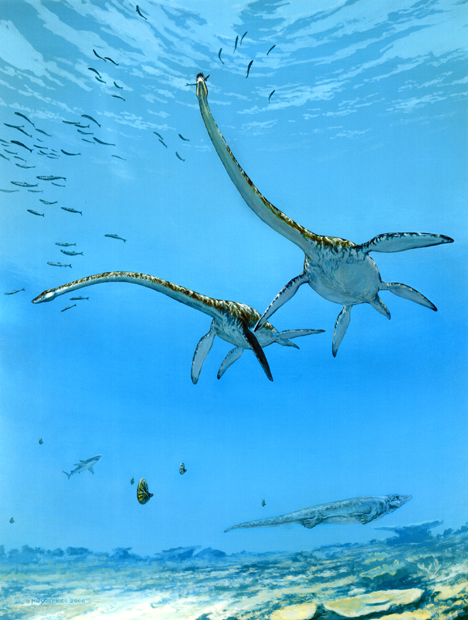 The largest plesiosaur specimen ever found was over 60 feet long, larger even than the Tyrannosaurus rex. 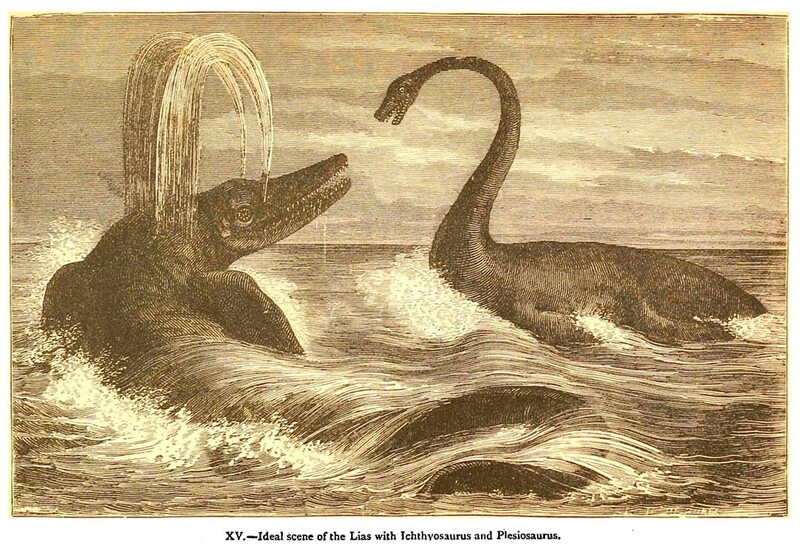 Some scientists believe that plesiosaurs may have been the biggest predators that ever lived. Plesiosaur fossils have been found on every continent on earth, including number of specimens in the midwestern United States (six different varieties have been found in Kansas alone). Dwelling in the warm-water ocean that covered the Midwest during the Mezozoic era (250 million to 65 million years ago), the plesiosaur cruised below the surface of the water, using its long neck to pivot its head into position to snap up fish and mollusks, as well as octopus, squid, and cuttlefish. Like many large reptiles, mammals, and dinosaurs of the era, the plesiosaur perished during the Cretaceous–Tertiary extinction event, or K-T extinction, which occurred approximately 65.5 million years ago. Some scientists believe a series of catastrophic events, such as massive asteroid impacts or volcanic explosions, caused a huge disruption to earth’s ecology that resulted in the sudden death of thousands of species. Other researchers believe that extinction occurred more gradually, with species dying off as the sea level fell and the climate grew cooler. It is estimated that 30-40% of marine animals died off during this time. As for Lewis and Clark, they carefully gathered up the specimen they found atop the sulphur bluff. 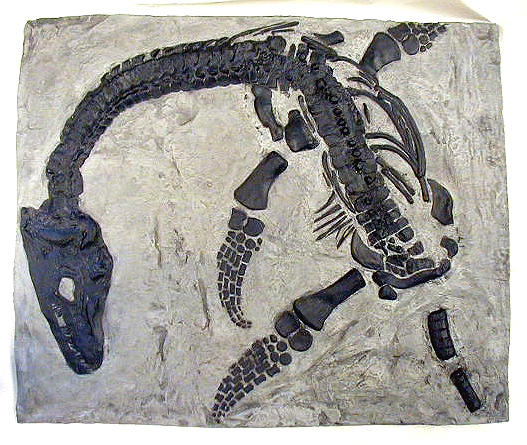 The remains of the fossilized plesiosaurus backbone was among the items they shipped back to Thomas Jefferson in the spring of 1805. According to the notes in the Moulton edition of the Lewis and Clark journals, the specimen still exists. Some of the bones are believed to be in the Smithsonian Institution’s collection today.